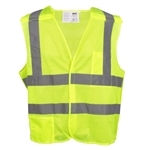 This industrial fire-rated clothing category includes a complete lineup of Occunomix fire-retardant clothing and Cordova flame-resistant clothing in jackets, bib pants, bib overalls, coveralls, hoodies, sweatshirts, shirts, jeans and more. You'll also find some very high-quality, shoulder-length, flame-resistant helmet liners, fire-resistant aprons and complete three-piece rain suits that are water and flame resistant. Popular FR jackets include the insulated duck, modacrylic bomber jacket from Cordova. These are warm, comfortable, durable and fire-safe. Our selection of Cordova flame-resistant coveralls includes HRC 2 PPE-standard models that also meet specifications set out by ASTM and NFPA. You also have access to Cordova’s disposable FR coveralls, often worn to provide a secondary fire protection layer.